"Ever Alive to the Interests of His Flock"
On November 11, 1880, onetime chaplain of the Fifty-First Illinois Infantry, Lewis Raymond, and his wife Mary Carroll celebrated their golden wedding anniversary in Chicago at the First Baptist Church. Raymond was 73 years old, his wife 69 — both natives of New York; Lewis was born in Delaware County in 1807. The guests called the chaplain by his late-years title, "Father Raymond" and presented him with a gold-headed cane. He gave them a synoptic history of his life:— He entered the ministry in July 1831 as the pastor, simultaneously, of two small churches in New York. He then took up "evangelical work" and, in the service of that, moved to Milwaukee in 1844 and to Chicago in 1849 where he was soon pastor of Tabernacle Church on La Salle Street. In 1854, he was on the move again, this time eastward to Sandusky, Ohio where he organized a church and pastored it for several years. He came back to Illinois and was pastor of the Union Baptist Church in Aurora and then of a church in Peoria. When war came in 1861, Raymond accepted the chaplaincy of the Fifty-First Illinois, of which his son Samuel Raymond was major. Another son, Eugene, was a private in Company K.
Raymond's career as chaplain of the Fifty-First was quiet as far as leaving traces in contemporary documents goes. He is mentioned now and then in the few diaries and letters that the men of the regiment left behind and occasionally his letters from the field were published in the Chicago papers—not very often, but the letters that were printed were meaty. He tended to the physical and spiritual well-being of the men, as his best lights dictated. The Chicago Tribune, in the golden wedding anniversary article, said that his efforts led to the conversion of 60 souls among the men of the regiment, and six of the 60 became ministers. Edward Tabler wrote in his diary for January 18, 1863, "Our Chaplain back in Nashville on duty, therefore we have no preaching on the Sabbath Day." At the time Raymond was detailed to provide chaplain services at Hospital No. 1 in Nashville. Tabler seemed to miss Raymond's services; a week later, on January 25, he wrote, "Our Chaplains have all been detailed or left on furloughs, that we don’t have any meetings, and it is rather dry times." Raymond's ideas of the care of souls did not always agree with the army's view of how to man a war, as his conflict with Surgeon Jerome Weeks below demonstrates. Having felt for some time that the influence of Chaplain Raymond in the hospital is bad on the men, as to get them discharged appears to be his whole aim. I talked with him on the subject before. He was put under arrest for his meddling in the Mich 10th, and he promised to do different — but am satisfied that he still keeps up a feeling of insubordination in an underhand way that is unhealthy in the establishment and would request most respectfully that he be relieved from duty here (as in my opinion it is better to keep a good home for the men here and not discharge as long as there is any hope of curing them here). The chaplain of a federal military hospital had a central role at the hospital. "In addition to duties of a purely spiritual character, this officer performed valuable service by keeping a record of special patients, with the post-office addresses of their nearest relatives, and writing letters for those who desired to communicate with their friends but were unable to do so on account of wounds, sickness or other causes. The chaplain had supervision over the postal service, the reading-room, library and cemetery" (Medical and Surgical History of the War of the Rebellion). Whether or not Weeks' conviction of Raymond's doing bad things "in an underhand way" while performing these important functions was adequate in itself to get Raymond reassigned, Raymond was indeed reassigned after approval of the recommendation by Thurston and Medical Director G. Perrin. Perhaps Weeks' opinion asserted itself in an increasing number of cases—without Raymond there to effect the contrary—and a few more men were kept on in the hospital until there was no "hope of curing them" when they then might be sent home to die if they did not die en route, rather than discharging them to family care and more benign local circumstance before hope of cure was gone. On Christmas Day, 1863, and a letter to Brig. General William D. Whipple (Chief of Staff to George Thomas, head of the Army of the Cumberland) , headed "Head Quarters 51st Ill Inf., Chattanooga", Raymond wrote, "Believing in the present unsettled state of my regiment, I can for some time to come be more useful in the hospital than in the field, I respectfully request a detail to labor in conjunction with Chaplain Thomas B. Van Horne in the general hospitals at this point." The Fifty-First in its "unsettled state" was freezing half to death and trying to find something to eat at Strawberry Plains in East Tennessee where it, with many other regiments, had gone to help Burnside against Longstreet. The regiment at that time was caught up in reenlisting, Colonel Bradley was away recovering from Chickamauga wounds, Raymond's own son, Samuel Raymond, who had command of the regiment, resigned after Chickamauga on October 8, 1863. Next in command Charles Davis had been severely wounded at Missionary Ridge on November 25, so things were unsettled with the regiment. The Chaplain's request was granted and he and Van Horne worked in the Chattanooga hospitals, which held many of the wounded from Chickamauga and Missionary Ridge. Van Horne was chaplain of the Thirteenth Ohio Infantry (and later author of The Army of the Cumberland, which was first published in 1875). The work in the hospitals metamorphosed into tending to the burial of the dead soldiers, especially at Chickamauga where many Federal soldiers had died while the field was in the hands of Confederate forces. The work of interment of the Chickamauga dead fell to the leadership of Van Horne and the Western Sanitary Commission, which was largely (and well) guided by Ohio physicians. General Thomas, by general ordered dated December 25, 1863, established the Chattanooga National Cemetery, which stated, "...all work upon the cemetery shall be exclusively done by the troops of the Army of the Cumberland." To the end of securing decent burial for all the Chickamauga dead, Captain Greshom M. Barber of the Ohio Sharpshooters, with his company, in mid-February, 1864, searched the Chickamauga battlefield for unburied soldiers and temporary graves. They took notes and made lists and the soldiers they identified were for the most part eventually reinterred at the new Chattanooga National Cemetery. Dr. A. N. Read, an Ohio physician, working with the Sanitary Commission played a central role in this effort. What part exactly Chaplain Raymond played we do not know. In February, that work dwindled. Chaplain Van Horne wrote to Chief of Staff Whipple, "I have the honor to state that Chaplain Raymond of the 51st Reg. Ill Vol Infty has expressed his intention to reenlist with his regiment, and with your permission will be relieved from duty with me. I have ascertained that the burial of the dead at Chickamauga has been done at the suggestion of Mr. [Dr. A. N.] Read of the Sanitary Commission." Thus, Raymond returned to the regiment in time for its field campaign through Georgia in 1864. "The boys are rather hard on you." He replied: "Well, I expected it." Then, with a ray of hope, he added, "I wish you would ask them not to take the corn in that barrel on the stoop, for it's every morsel of food they have left us." "Why, back at that house I saw you leaving as I rode up. My eyes were sharper than yours. I found it in a barrel on the stoop." Assuming an expression of utter astonishment, I said, "If it comes to this, that a chaplain of our army has got to rob a poor old couple of their last bit of food, I think our cause will never prosper." He quickly demanded an explanation and I gave him the facts. He said the boys told him that no one lived there. Turning his horse, he rode back and emptied the corn into the barrel from which he got it. 1) I have cheerfully performed my duty in that position for more than three years (3), most of the time on the front, with my Reg't since my "muster in," and two of my sons entered the service in 1861, showing our disposition as a family to share the privations and perils of this war. 2) The condition of my family, having no son at home of sufficient age to attend to their wants, and, intelligence just received of financial matters that may involve me in serious losses unless I can give my personal attention to them, demand my retirement from the service as soon as I can honorably do so. 3) Our late severe campaign [through Georgia], the latter part of which, my horse having died, compelling me to march on foot over 100 miles, has affected my health so that at fifty-seven years of age (57), I do not feel equal to the winter campaign. Feeling unable myself to determine whether I could be promptly mustered out of a regiment that had re-enlisted as "Veterans," I take this method of expressing my desire to the gallant commanders of this army to be honorably discharged from the service. The writer of the regiment's compact history for the Illinois Adjutant General's Office wrote, "September 28, moved to Chattanooga, and thence to Bridgeport, Alabama. October 18, moved to Chattanooga. Here 192 drafted men joined the Regiment. Here, too, Chaplain Raymond, a venerable and good man, resigned." Raymond was the only man to receive such an endorsement in the AGO compact history. The "Historical Memorandum" of the regiment recorded, "On leaving Chattanooga the Regt bade adieu to Chaplain Raymond who remained to await the acceptance of his resignation. He had been from the first a zealous hard working man ever alive to the interests of his flock—leaving now because, being long past the meridian of life, he felt himself unequal to the hardships of a winter campaign." Raymond's resignation was accepted and became official on November 6, 1864. After the war, for a short period of time, Raymond resumed the pastorate of his old church in Peoria, but he soon came back to Chicago and lived there at 3006 Vernon, not far from Lake Michigan on the near south side between 29th and 30th Streets, very near the current location of Michael Reese Hospital. He died there at the age of eighty on December 10, 1887. The stated cause of death was enlargement of the prostate and cystitis. 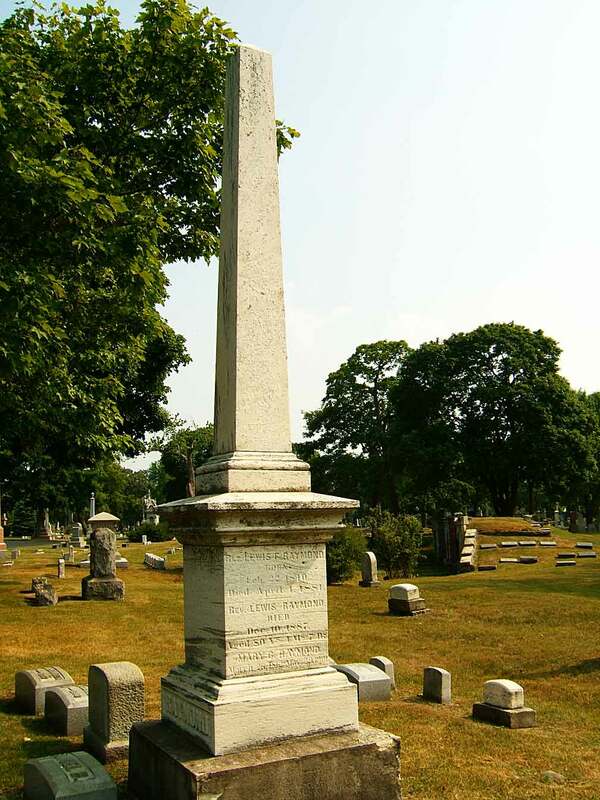 He was buried at Graceland Cemetery in Chicago (Raymond Family gravestone cluster at Graceland shown below. The chaplain's name is engraved second on the stone, his wife's name below, a son—also a minister, also a Lewis—above.). Biographical research by William Edward Henry. Raymond in Uniform Photo, courtesy of Historical Data Systems, American Civil War Research Database at www.civilwardata.com. Wilbur F. Hinman, The Story of the Sherman Brigade, Alliance, Ohio: By the author, 1897, p. 537-8. M[atthew] C[anfield] Read, "The Work of Ohio in the U. S. Sanitary Commission in the Civil War," in Henry Howe, Historical Collections of Ohio, Vol. 1, 1888, pp. 196-7. "Chaplain William Earnshaw was charged with the burial of the dead and the ornamentation of the grounds at Stone River and Nashville, and another chaplain sustained a similar relation to the cemeteries at Chattanooga and Marietta," Thomas B. Van Horne, History of the Army of the Cumberland: Its Organization, Campaigns, and Battles, Written at the Request of Major-General George H. Thomas Chiefly from His Private Military Journal and Official and Other Documents Furnished by Him, Cincinnati: R. Clarke, 1875, p. 578. Was "another chaplain" Lewis Raymond? Jerome Weeks, Compiled Service Record, 51st Illinois Infantry, Records of the Adjutant General's Office, 1780's-1917, Record Group 94, National Archives and Records Administration, Washington, D.C.
Lewis Raymond, Compiled Service Record, 51st Illinois Infantry, Records of the Adjutant General's Office, 1780's-1917, Record Group 94, National Archives and Records Administration, Washington, D.C.
Chicago Tribune, November, 12, 1880. Medical and Surgical History of the War of the Rebellion. Part III. Volume I. Medical History. Being the Third Medical Volume. Prepared under the Direction of Charles Smart, Surgeon General, United States Army, Washington: Government Printing Office, 1888, pp. 398, 957. "Historical Memorandum", 51st Illinois, Descriptive Roll, (301.023), Illinois State Archives, Springfield, Illinois. Death Certificate, City Board of Health, Cook County, State of Illinois. Graceland Cemetery photography by Cindi Lynn Geeze, Chicago.